Autumn Has Arrived — Time for Punch! Makes 18 to 26 servings. 60 or so pomegranate seeds, distributed among six double-rocks glasses, which are filled with water, frozen, and added to chill the Punch [this is not necessary, but it’s fanciful — a quart-sized ice block or a dozen ice spheres will do instead]. 20 apple slices, cut perpendicular to the core to allow the star shape to be exposed. 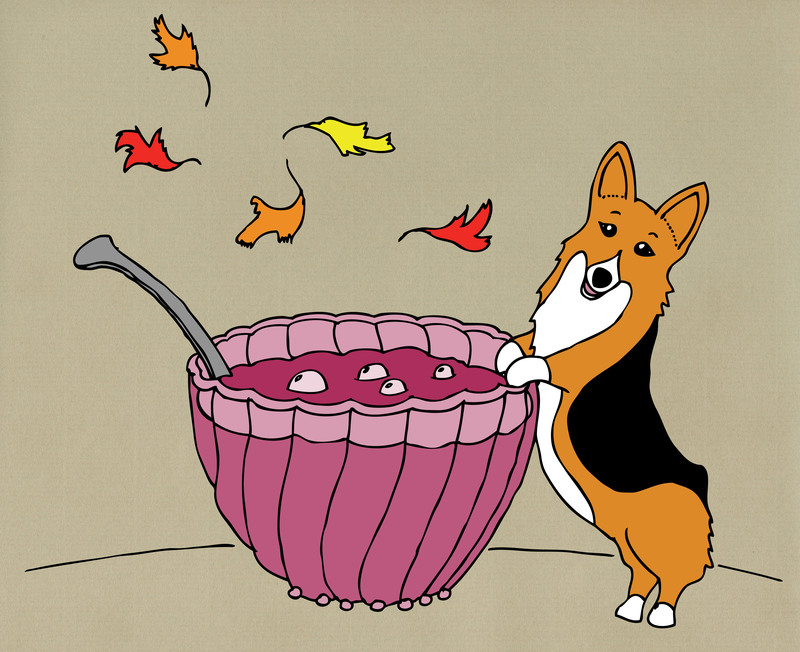 Combine all the ingredients in a punch bowl and stir to combine. Add the apple slices and pomegranate ice cubes [15 minutes] before serving. In a cast iron pan (or other heavy-bottomed pan), toast the spices for 2 to 5 minutes, tossing frequently, until aromatic and lightly browned — be careful not to burn them, and pull them off the heat immediately if you see smoke. In a sauce pan on low heat, combine honey and water, stirring to dissolve, then add the toasted spices. Simmer for about 10 minutes on medium heat to infuse the syrup. Remove from the heat, strain out the solids with cheesecloth, and allow to cool before using in the Punch. Created by the Bon Vivants of San Francisco. Adapted from the recipe found in Dan Searing’s book The Punch Bowl (Sterling Epicure, 2011). Combine all the ingredients and stir, then add ice and stir. Strain over ice cubes into a Collins glass or double Old-Fashioned glass. 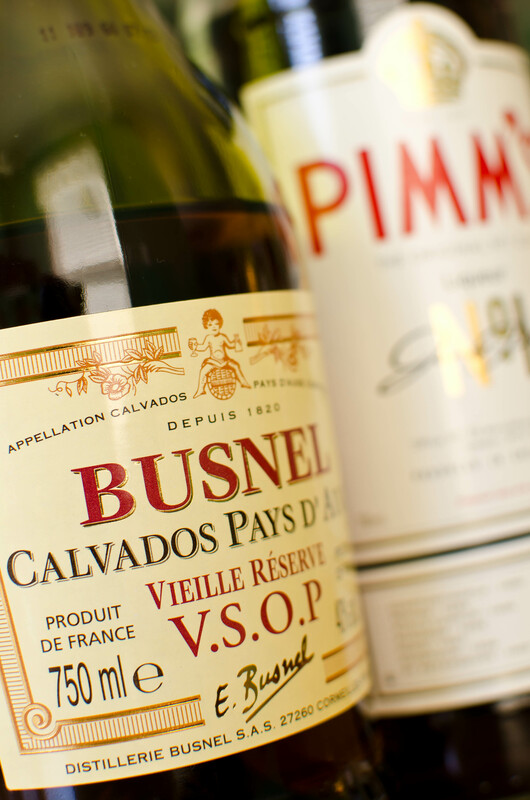 While Calvados may be a bit difficult to find in this country, it is well worth locating some for this Punch, particularly if you can obtain the Busnel VSOP that I suggest for this recipe. Boulard Grand Solage VSOP, which seems to be much more common (in Georgia, anyway), has a flavor profile that is a bit too bold and acidic, with a Chianti-like nose that I’ve harped on before. Busnel is a bit more subtle — the subdued sour-apple notes are accompanied by touches of oak, resin, and caramel that make me think of cognac. Mixing the Carousel Punch with calvados yields a highly complex, multi-layered concoction that is redolent of ripe apples and accented with tartness and odd touches of herbs and spice that you can’t quite decipher. Being a fiend for American applejack, however, I had to try out the Carousel Punch with Laird’s brusque, hard-hitting Bonded Apple Brandy. The result? Mixing with Laird’s Bonded, the Carousel Punch loses a significant degree of its subtlety and complexity and becomes much more straightforward and “cider”-like, emphasizing the spice and honey instead of the fruit. Altogether, Laird’s provides a deeper, stronger flavor, but one that is less interesting. I have not attempted mixing up an individual portion with Laird’s 7-1/2-Year-Old, but I would have to guess that the results would be similar to those of the Bonded and would necessitate a reduction in the amount of honey syrup (as Laird’s Old is fairly sweet). I imagine that this Punch would be remarkably improved by the use of recently-pressed, unfiltered apple juice obtained from a North Georgia orchard, but time forced me to obtain apple juice from the local Publix, and the Punch turned out just fine. Go the extra mile if you can, though, since it is apple season…why not splurge a little? Like the Zoar Valley Punch we served last Christmas, the Carousel falls into a category I call Neo-American Fancy Punch: the “Neo-” is due to its origin in the 21st Century, but the “Fancy American” designation comes directly from David Wondrich. 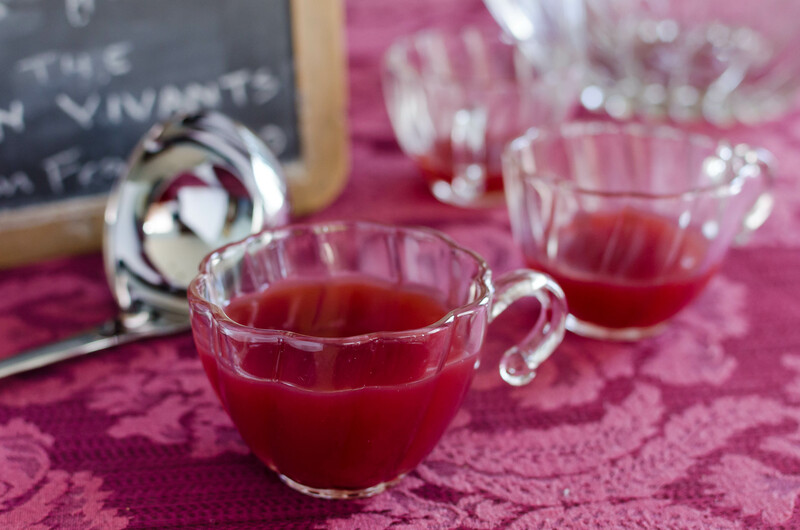 The basic five-ingredient formula of Punch — sweet, sour, strong, weak, and spice — has is maintained in the case of Fancy Punch, but it becomes much more difficult to separate each component. Calvados? Well, obviously, that’s “strong,” but with a hint of “sour.” Pimm’s? Slightly strong, fairly sweet, but with a significant degree of spice. Apple cider/juice? A mix of sweet, tart, and sour, with a slight spice. Lemon juice? Well, that’s straight-up sour. Pomegranate? an odd combination of tart and sweet. Then there’s the honey syrup — the honey has a sort of floral smokiness that isn’t like any other sweetener out there, and to top it off, you’re combining that unique sweetness with toasted spices (five of them, no less). Overall, there’s quite a lot of cross-category complexity going on in the Carousel that is typical of Punches mixed in America through the late 19th Century. Think of the Philadelphia Fish House Punch or the Chatham Artillery Punch, whose recipes, although fairly simple in their original forms, evolved to include bottles of champagne and oddities such as jars of maraschino cherries, green tea, and miscellaneous fanciful liqueurs. As Wondrich notes in Punch, Americans took Punch and individualized it, creating the Cocktail and the Sour to meet their daily drinking needs. Rather than being the day-to-day communal staple, Punch became a luxury item composed of other liquid luxuries, a grandiose Sour concocted on Occasions of Note (or Occasions of Notoriety, as the case may be). It’s wonderful to think that the tradition of Punch has not been lost to us, and that modern-day mixers have re-discovered the ultimate party drink. As the weather cools, we seem to seek out companionship at boozy gatherings, so why not welcome Fall with a spicy, fruity bowl-full of Reverence for Punches Past served out to your friends and neighbors? Photos and Image by IJL. This entry was posted on September 24, 2012 by IJ Lauer in Calvados, Drink Recipe, Heron Social Club, Honey Syrup, Ingredient Recipe, Lemon Juice, Peychaud's Bitters, Pimm's, Whiskey Barrel-Aged Bitters and tagged apple juice, autumn, bon vivants, calvados, carousel punch, drink recipe, fall, lemon, peychaud's bitters, pimm's, pomegranate, punch, whiskey bitters.